Brandlin: Sometimes there is no substitute for a physical mock-up! Sometimes there is no substitute for a physical mock-up! 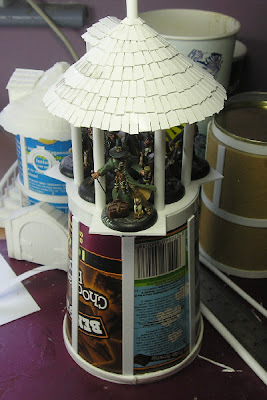 I've spent a half hour or so making a mock-up of the base of the Benan Wtachtower. 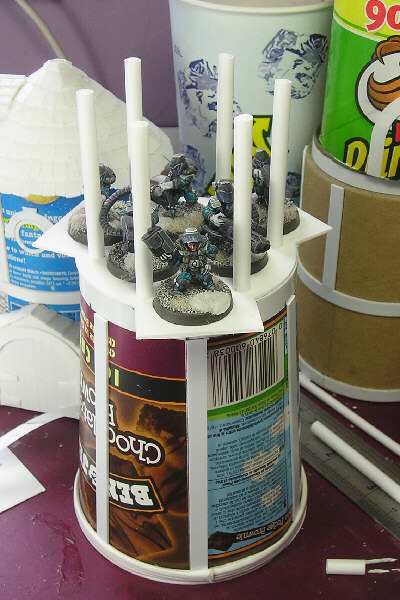 I dont normally do this on the models - the first time there is a phsical assembly is when i put together the test cut from the laser cutter, but in this instance i wanted to check the access for fitting figures onto the watchtower platform. This mock-up is made from hand cut pieces. From the CAD geometry I knew that this would be tight but that the figures would fit on the platform, what was less clear was if the figures could be placed between the pillars. The answer is - YES THEY WILL! 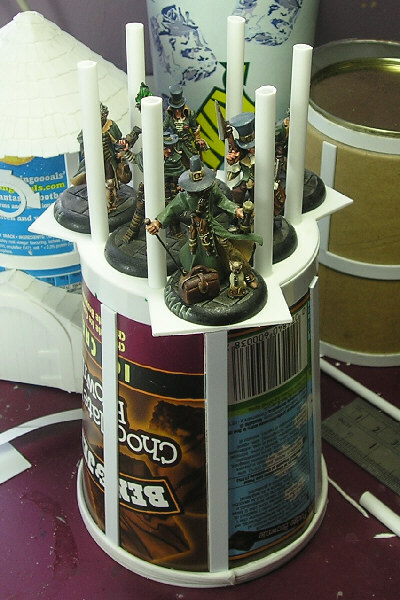 You have to tip the figure to get it between the pillars and it is a little fiddly but I think worth the effort to keep the overall design of the tower. 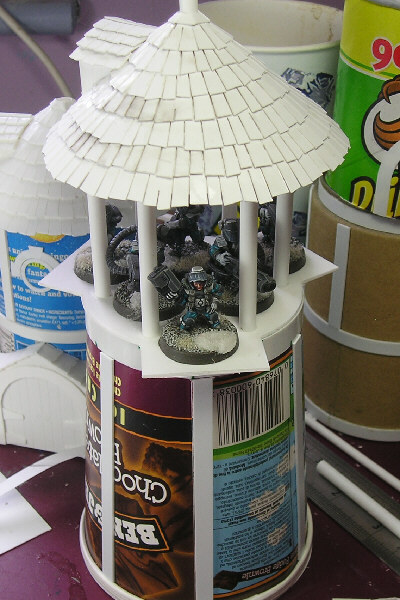 The roof shown is the prototype for the stables kit - the watchtower will have the canopy shown in the CAD images, but it shows the versatility of being able to swap roofs should you wish. Figures here are Hasslefree Grymn (space dwarfs) on 25mm bases. They are just what I had available and based. No tipping required here. The final picture shows further options with this kit. As the upper surface of the watchtower is the same diameter as a Pringles tube (in fact it incorporates some sections of Pringles tube to extend the height slightly) a section of tube and therefore parts from the tower or stables kit too can be added to the watchtower to create another unique design. I don't seem to be able to get away from Pringles tubes do I? As always comments, suggestions and your money are greatly appreciated! An inspired use of a Ben & Jerry's Ice-cream tub! And as we all know you can never have too many Pringles tubes! Keep up the good/great work. I think the new tower looks better with the round roof rather than the hexagonal one.